Summer is rapidly slipping away and I have fall decorating on my mind. Using SCRABBLE letters is a fun way to add personality to your decor and it's super easy to do. I pulled out the old SCRABBLE game and used the letters to decorate a cozy fall vignette. I added plush pumpkins, a tiny mum, and a dried hydrangea to the vignette. The pumpkins are handcrafted by me. The one on the right has a driftwood stem and is my newest creation. The small guy on the left I made last year. You can read the tutorial here. For the mum, I made a skirt using burlap and crochet ribbon. I just wrapped the ribbon around the plastic container, gave it a dab of hot glue and added SCRABBLE letters to the top. Yup that N is upside down! Of course, I noticed my mistake while writing this post. I love using nature to decorate with! What a great idea - using the scrabble letters as a decor:-) Love it!!!! Thank you so much for joining in the Harvest Tour of Homes. I love this vignette. 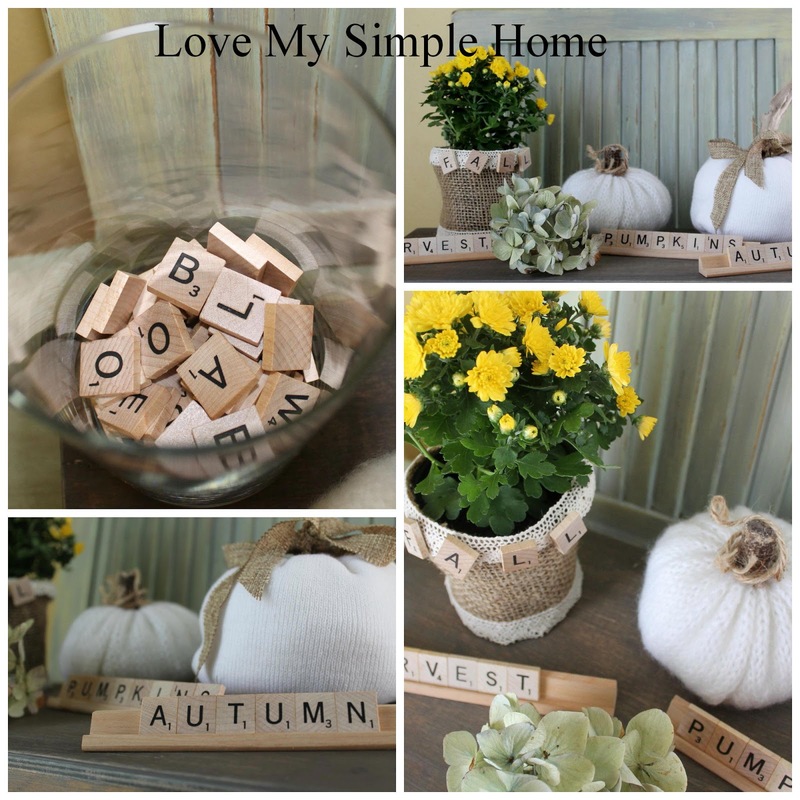 The gorgeous neutrals are perfect for fall, and the Scrabble letters are such a fun touch! I love this idea and your homemade pumpkins stole my heart. Very charming and inviting! I love using scrabble letters and tucking them here and there in unexpected places.....hope I don't have to track them all down to actually play the game! Love this. I wish I had a vintage Scrabble game! I love your pumpkins. I made a few today! I'd love for you to come over and link your Fabulous post at The Fabulous Fall party. Come over and share at the party! I love your scrabble letters ideas and the pumpkins are so beautiful. I am stopping by from the Havest tour. Enjoy your day. Those scrabble letters a such a great idea....Love it! Absolutely love this vignette! The pumpkins are beautiful and the scrabble letters are the cutest touch! I stopping by from the Harvest Home Tour. What a fun idea to add the Scrabble tiles. I love that! Stopping over from the Harvest tour. Very lovely decorating. I need to get on the ball. I love your use of the Scrabble letters. (I'm doing good if I can make one word for a vignette out of my two scrabble sets. Thanks for adding this to the weekly share link on Bloggertunities. 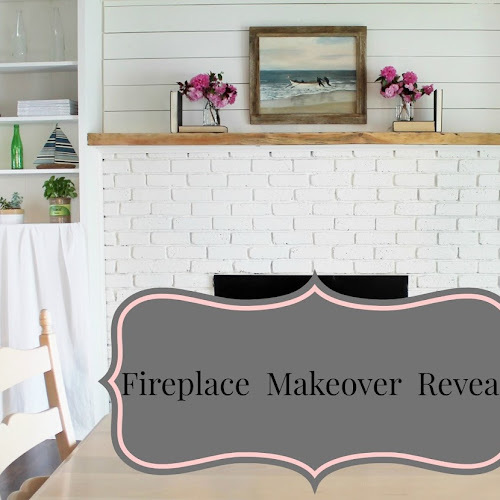 I'm sharing it on my Friday Faves this week. Love the Scrabble letters, such a fun way to celebrate...being able to change it up too! Love this! How very original! The scrabble letters and the fabric pumpkin are fab together! So cute! I'm working on my fall decor right now, and you've given me some great ideas! I love how you've used the scrabble letters, the upside down N is just a quirky bit of fun to see if people notice - adds character! I love using Scrabble letters for decorating. I've made some Christmas ornaments with them, but haven't used them this way. It all looks lovely and the white pumpkins are perfect with the wood. Thanks for sharing on Snickerdoodle Sunday. Pinned to my autumn decor board. i just love the scrabble tiles. so cute! Very sweet vignette! I found an old Scrabble game a little bit ago. It's perfect to change up the words. It's my Mom's favourite game so it's kinda nostalgic for me as well. Love your pumpkins too! Great idea to use the scrabble letters. I forgot I have some ... inspired to find them and add to my Fall mantel.